Blackline Safety's Loner Bridge System was just named the 2015 New Product of the Year by Occupational Health & Safety (OH&S) Magazine. The Loner Bridge System was recognized under the "safety monitoring devices" category. Blackline also won this award in 2013 with the Loner IS. 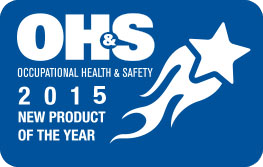 According to OH&S the "award program honors the outstanding product development achievements of health and safety manufacturers whose products are considered particularly noteworthy in their ability to improve workplace safety." “I congratulate all of this year’s entrants on their fine work and thank them for participating. We certainly hope they and many other manufacturers will enter our eighth annual contest next year, as well,” said OH&S Editor, Jerry Laws. Check out the winners in other categories here. next post »ARE MY COMPANY'S SAFETY SOLUTIONS A BREACH OF MY PRIVACY?